In August we announced the arrival of our WalletStick Flash Drive. 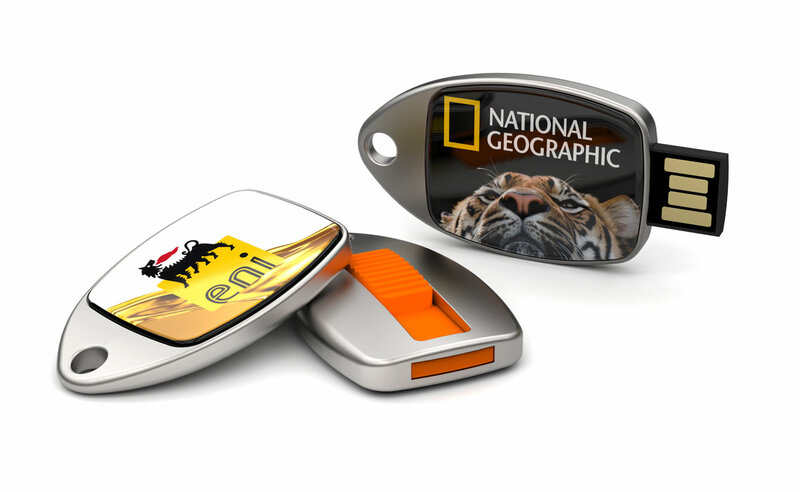 This month we’re pleased to announce another new arrival – the Fin USB Flash Drive. The Fin model has a chrome-plated zinc alloy body and a large branding area that can showcase your organisation’s message or image in full photographic colour. As shown below, the Fin features a sliding mechanism that can present or hide the USB connector. At the time of writing, the Fin is available in all of our capacity options: 2GB, 4GB, 8GB, 16GB, 32GB, 64GB and 128GB. The Fin is available in our 8 standard colours: White, Black, Blue, Red, Green, Orange, Yellow and Pink. You can also get the shell Pantone matched if you order 250+ units. It’s then up to you what you’d like to brand the ‘canvas’ with. Currently, the Fin model is included in our 6 working day lead time service. 7 working days in South Africa. Simply fill out our Quick Quote Form and a dedicated Account Manager will contact you as soon as possible. We can even send our samples to view before you place your order.